Princess Shashi Raje of Dewas in an embroidered ghaghra-choli looking poised and a little enigmatic in a studio photo. The choli is almost completely hidden by jewellery and yet it doesn’t feel excessive. Arm bracelets seem to have been very popular in the 1920s/1930s. 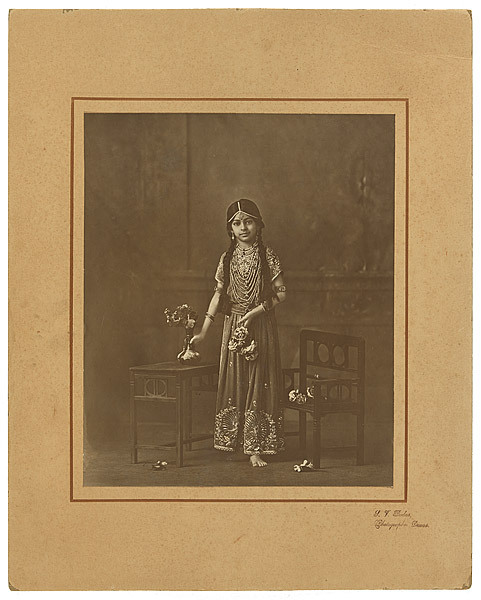 This entry was posted in India, Sari Blouse, Vintage, Vintage Blouse and tagged 1920s, blouse, gelatin print, india, princess, Shashi Raje, studio portrait, vintage, young girl. Bookmark the permalink.